I thought the color would be more black. The placemats themselves are very nice and what I expected. Striped Leather & Cotton Chindi Placemats (Set of 4) - 14"x20"
Jute Chindi Braided Placemats (Set of 4) - 14"x20"
Ever step into someone's home and admire their décor? What about their placemats? These dining table placemats definitely will be admired. 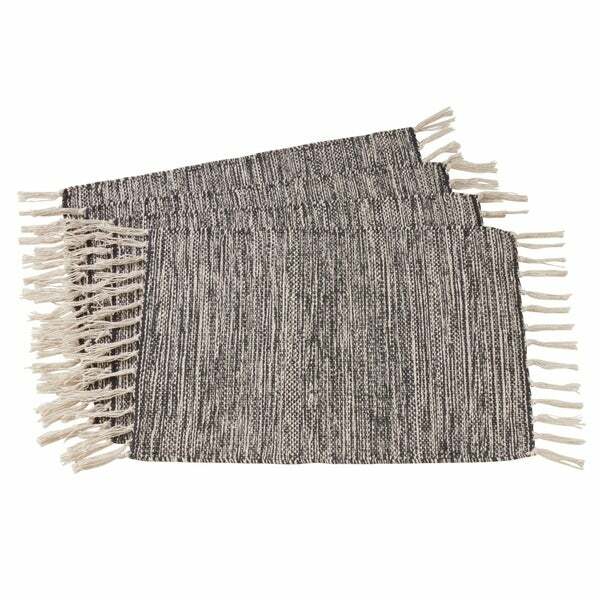 These rug-like inspired, oblong-shaped, made from 100% cotton, placemats, feature tassels that give them an added flair. They have an unsaid eclectic feel with a touch of hippie and ethnic inspiration. Comes in a set of four, these rug placemats are great for entertaining and daily usage. A placemat also helps protect your table against spills, food debris and heavy dinnerware. Dimensions 14.0 In. X 20.0 In. X 0.15 In.